A franchise provides one party with the right to market the goods or services of another business. 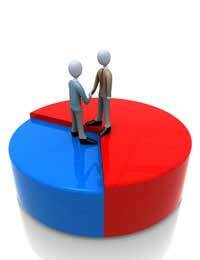 The contract that governs this relationship is called a franchise agreement, or license agreement. In the UK, a typical franchise agreement lasts for a period of 5 years and is renewable or terminable on expiry. Franchisors often have considerable amount of control over the ways in which franchisees run their businesses, retaining the right to cancel or suspend the agreement in certain circumstances. This is to protect the reputation of the business, and prevent the value of the brand from being damaged. Franchises are less a business and more a marketing method for expanding the availability of a company’s goods and services, heightening brand profile. Because a franchisor is likely to have more than one franchisee, the franchise agreement is usually non-negotiable. This means that it is not possible to amend or omit any of the terms of the franchise agreement, as this would make the implementation and running of multiple franchises administratively complex. Therefore potential franchisees should work on the basis that the franchise agreement, which is usually at least 30 pages in length, cannot be changed. A typical franchise agreement is generally longer and more detailed than other commercial agreements as it contains significant detail about the rights and obligations of each party. The attraction of buying a franchise is that of following a successful and proven business model. As a result potential franchisees are unlikely to be persuaded that a simple agreement confers enough detail in relation to the benefits of running a franchised business. Definitions: There will usually be a list of definitions at the beginning or end of the document, which explains commonly used words, phrases and abbreviations referred to in the agreement. There should be a comprehensive list of rights and obligations granted by the franchisor to the franchisee under the agreement, and obligations of the franchisee to the franchisor. These can broadly be divided into two categories: initial obligations, for the set-up and commencement of the franchise, and ongoing obligations for the term of the franchise agreement. Fees for the franchise may be put into several distinct categories, such as an initial license fee, which is usually payable on signature of the contract (also known as a franchise fee), continuing fees, which may be commission based or a monthly flat fee, a contribution towards local and national marketing, training, as well as IT and technical support. Franchisors and franchisees both share a common interest in making the franchise business work and therefore there will be a high level of communication between the two, especially during the start up and period of establishment. As well as the benefits that this guidance and assistance can bring there will also be a high degree of accountability in terms of sales, profit and loss accounts and other records. Depending on the type of franchise business, there could be a requirement to buy equipment, stock and other material either from the franchisor directly or to use approved suppliers. There may also be approved insurers, builders, printers and other contractors that franchisees must use in connection with the franchise business, as well as requirements in relation to networking capabilities and bandwidth. One of the most important aspects of a franchise is that which pertains to intellectual property. The intellectual property of the franchisor is unique to its business and it is this element that is particularly valuable. The intellectual property will be licensed to the franchisee to use the logos, trademarks, copyright materials such as company literature and the operating manual (how to run the business), all of which have immense value to the identity, integrity and success of the franchise. Contained within the franchise agreement there will be a clause or section entitled ‘Restrictive Covenant’ or ‘Competition’. Alternatively this information may be contained within another clause, such as ‘Procedure on Termination’. This section will contain the restrictions placed on the former franchisee person/persons in order to prevent ex-franchisees from immediately setting up a business in direct competition with the franchisor. Therefore there is likely to be some restriction on trade, such as not to contact past clients, or operate within the territory of the franchise, or a certain area around the territory for a period of e.g. a year. A franchisor is entitled to protect its business from damage, but if a court considers such restrictions to be excessive they are unenforceable. A considerable number of franchisees are newly-incorporated companies. As a result, they do not have assets or any significant trading history. Often it is the case that the individuals who are purchasing the franchise provide a personal guarantee to the franchisor up to a certain level of liability. This means that if the franchise business owes the franchisor money, or the franchise fails, the franchisor can pursue the individuals for an amount up to the level set by the personal guarantee.